Still driving up Highway 395 heading back to our multi-duck, cat and single rooster sitting job in Humboldt County we passed through the little town of Lee Vining and beheld before us the beauty that is Mono Lake. Growing up in California in the late 70’s I remember the history of Los Angeles diverting water for its growing needs and the outcry as Mono Lake and its fragile ecosystem was destined to disappear. 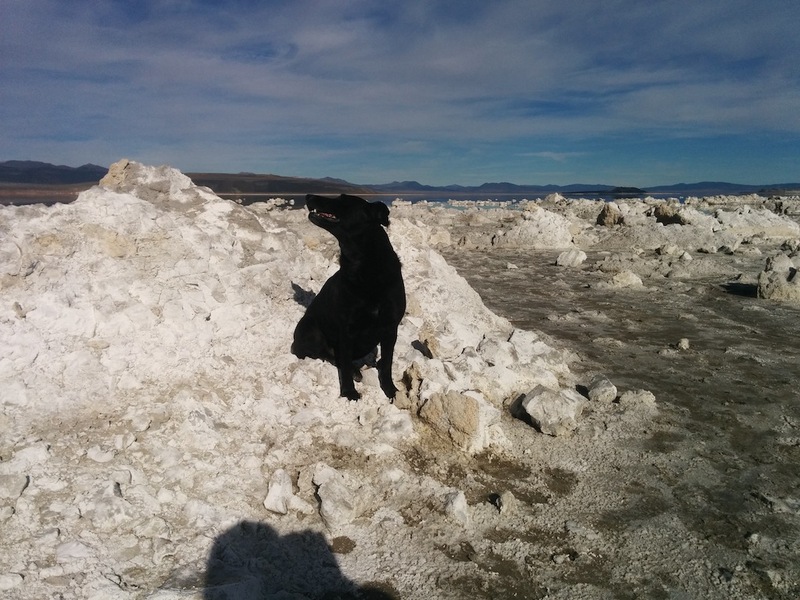 My parents took the family to the lake way back when I was a kid but this is Willow’s first time here and wanted to get a picture of her black-furred self against the white salts of the lake. We turned off at a little access road that led to a small parking lot, a pit toilet and not much else. We walked down to the lake area and went as far into the white salt and mud as possible until it was too slippery for me to continue. With Willow’s APD (All Paw Drive) she wanted to go farther and romp some more but time, as well as my desire to not have her harass any wildlife she sniffs out, dictates we just do the quick picture thing and then head back out on the road. I would have personally liked to have spent more time here getting updated on the Lake’s health and history but Willow’s need and desire to romp untethered takes precedence and so we head back northward towards the end of another day on our adventure.